Börs Anders making ocarinas from wood. He makes the ocarinas from pieces of Swedish birch, which he turns and drills to appropriate proportions. Then Börs Anders makes a block, cuts out a labium and drills finger holes in adequate positions. The ocarina encompasses from nine to eleven tones. It is fully chromatic. The Börs-ocarina combines the best from the ocarina and the recorder. Chalumeau is a precursor to today's clarinet. In late medieval time, it started as a wooden pipe, straight drilled, with a single reed. The scale range was 9 tones. It was later developed with keys and the range was thus extended. The chalumeau found it's final shape when it was drilled conically. This made it playable in three registers: low, middle and high. The cowhorn is one of the oldest instruments in the history of music. Maybe because the raw material was so easily accessible. The cowhorn has a very strong sound which can be heard from far far away. You could say it was the cell phone of the past. Horn (=nails) is a natural material which stays intact for a very long time. 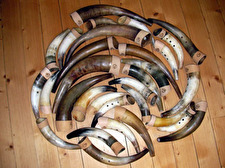 Some horns have been found which have been dated to the 10th century, using pollen analysis. They still look exactly like today's horns. The Swedish säckpipa that Börs Anders Öhman builds and plays originates precisely from the bagpipe of the deep forests of western Dalarna. It goes back to the Middle Ages and has been passed on through oral tradition. All the pipes are turned from Swedish birch. They are drilled with a straight hole with a diameter of 6 mm. The bag is sewn from vegetable tanned calf-leather and made airtight with a special kind of silicone which is spread on the inside before the bag is sewn together. This way, the bag doesn't have to be stopped up once a year. Börs Anders built his first bagpipe 20 years ago and it is still airtight. The bagpipe is blown in a specially constructed mouthpiece, which also comprises a maintenance-free valve. The chanter works in four keys and is very easy to tune in with the drone. 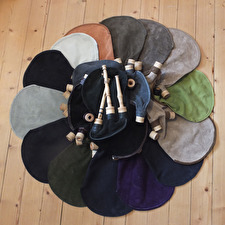 Nowadays Börs Anders makes chanters in three sizes. The basic keys are A, G and F.
Börs Anders' reeds from Swedish cane are prepared to withstand moisture. Panflute after a model from 9th century found in York, GB. This is the only instrument in wood found after the vikings. This is a very carefully made copy.